New Bridge Street - the approach to Blackfriars Bridge through the City of London - features a near useless cycling facility (by the way, whenever I hear politicians talking of cycling facilities they actually mean cycle parking but I mean it here in the context of the advisory cycle lane that wiggles along the side of this street). Shown on a Sunday morning, it's a wide street with plenty of space for everyone to get along. Shown on a Monday morning, though, here's the same street rammed with motor traffic. This is the same part of the street shown above but viewed from the opposite direction. 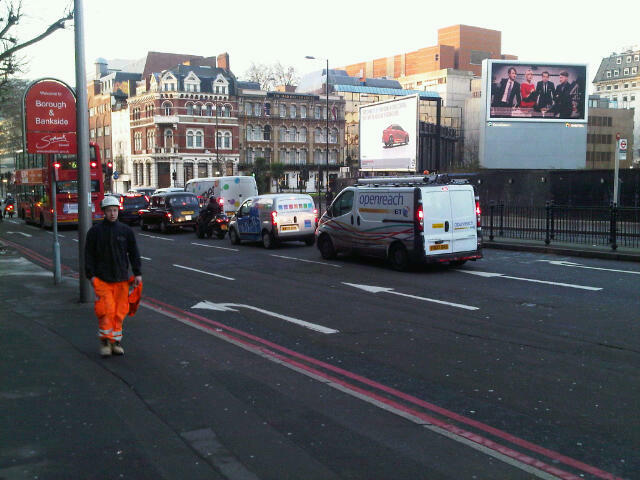 If you look hard, there's a guy leaning on his bicycle stuck in the queue of motor vehicles. 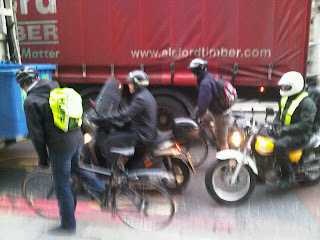 He's probably stuck with an HGV in front of him, another HGV beside him and a bus behind him. A little like these folk slightly further up the road. 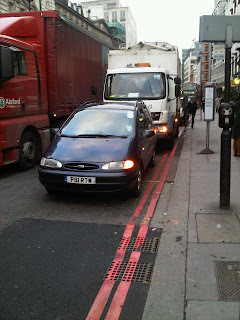 Or maybe he decided to give up on the traffic and 'mount the pavement'. You don't need to look too hard to see three people cycling along on the pavement. Even the chap on the cycle hire bike is scooting along on the pavement. I'd have done the same. Just got fed up with sitting in a queue of belching motor traffic going nowhere. The thing is conditions on this road are similar to this every single day. Transport for London is responsible for this stretch of City street as this is part of the trunk road network (TLRN). From what a number of politicians on both sides tell me, the City of London has a reputation for not playing ball with TfL. It seems that TfL and the City of London have a mutual antipathy. Question is: What would you do with this junction? Whack a bicycle route through all of this? Admit defeat and just leave it like it is? Narrow the pavement (the City tends to widen its paving space rather than narrow it)? Bear in mind, that general motor traffic gets only one lane to itself over Blackfriars Bridge itself and that seems to work perfectly well. But what would you do here? Tricky one. My personal view is you have to make it less convenient to drive and more convenient to use your own propulsion where you can. So, it's all well and good narrowing Blackfriars Bridge and putting a permanent bicycle lane along it. But it's not much help if the intersection at the other (south) end of the bridge inverses that. This is the southern end of the bridge, just a hop from the pictures above. It has four lanes for motor traffic. At rush hour, many people using this intersection on bicycles are turning right towards Waterloo. To turn right here on a cycle hire bike takes quite some nerve. The two women I know who regularly use this bridge actually get off here and walk over the junction. On a cycle hire bike, you have a machine that is pretty slow and cumbersome. And you have one lane of motor traffic fanning out into four lanes, usually at quite some speed coming down the bridge. It's an environment designed for the car. Whether it's 5,000 of us on bikes or 13,000 of us, we don't really get a look in at the intersections either side of the bridge. This is a route that prioritises the motor vehicle. And that's why, despite it being the centre of the city, despite the congestion charge, it's just not much fun to cycle across. I wonder if London will ever follow what Sydney's up to. Have a look at this excellent review on CycaLogical blog to see how Sydney is building a 55km segregated cycle way system through the centre of the City. None of that in London. If you want to know how seriously the City of London is taking cycling, look at the plans for Holborn Circus. Not a bicycle in sight. We've been magically edited out. My fear is we've been edited out not only from the nice picture but also edited out from the entire junction. It doesn't feel like this junction is going to get any better for cycling through, only worse. I may be wrong but all I see is space taken away from cycles, putting us in the main motor traffic flow where there would have been plenty of space for dedicated cycle facilities (and it doesn't need to be segregated, it just needs to allow bicycles to navigate the junction with room to manoeuvre). 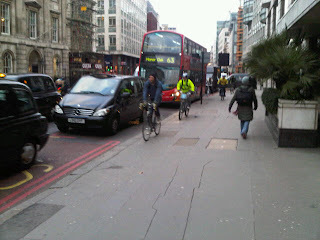 You see, a lot of people feel very passionately that cyclists belong in the main traffic flow. But when I look around me and when I drive or cycle through the City of London, what I see almost always are scenes like those at the approach and exit to Blackfriars Bridge. Being a bicycle in the main traffic flow here takes either nerves to tackle a scary junction or just takes boundless patience to sit in a crawling, lung-busting queue of motor vehicles going nowhere fast. 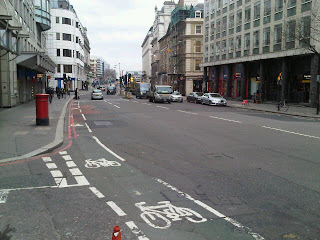 And the City of London is actively making its streets narrower (have a look at Cheapside here or at Holborn Circus here) so that these streets become similar to the approach to Blackfriars Bridge. A thoroughly useless route for efficient, safe or pleasant cycling, despite the fact this is a pivotal part of many cycling routes. Good post, but the problem is that the south end of Blackfriar's Bridge does have a cycle path... running down the middle of the road fenced off on either side. It's completely useless and I've yet to see anyone actually riding on it. As you point out: many streets already have some sort of crappy infrastructure for bikes. The question really is how do you overcome the barriers to making that infrastructure better? I agree that wide, fully segregated cycle paths which have priority are probably the way to go, but the barriers to implementation are enormous (it's not quite as simple as saying: 'look, this is what the Dutch do, isn't it marvellous?'). Wide, fully segregated cycle paths which have priority are definitely the way to go. If you want to turn right (southbd to westbd), stay in the left through lane and stop in front of the westbound through lane. It's a lot safer than filtering a right turn across northbound traffic and usually faster than waiting for the green arrow at the start of the next cycle. Hook turn boxes for cyclists are in use in Australia. Very good for use in congested periods and you can still make a normal right turn from the right turn lane if you think traffic is calm enough.